In line with our mission of managing the plantation estate in a safe and sustainable way to optimise the return to our investors whilst balancing the needs of our employees, customers and local communities; HVP invest a lot of time and resources into our trees to help them grow, but it takes less than 4 seconds for one to be harvested. The harvested logs are transported to our customers within days and the products such as sawn timber, post and poles, particle board and plywood can be incorporated into new houses and projects within weeks. Lower quality logs are converted into paper and cardboard. You could be reading our trees within a month of harvest. To ensure the safety of all of our operators we harvest our crop of trees with machines. These are high-tech, purpose built vehicles with computers that ensure we optimise the way we cut the trees to suit our customers’ requirements. 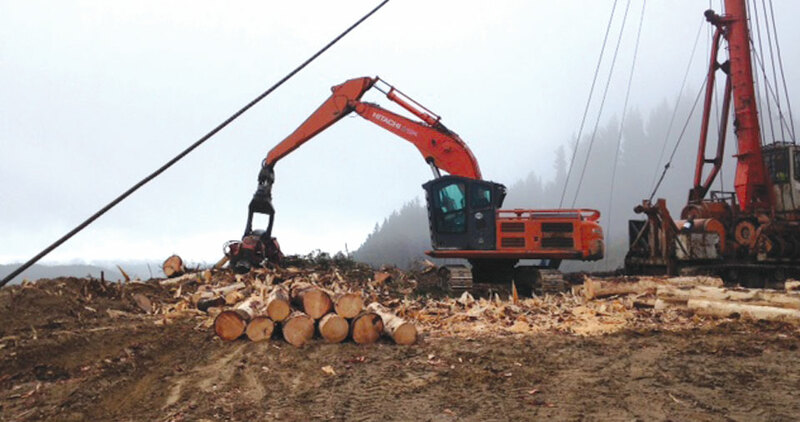 Where sites are very steep, to protect soil and water values, we move from ground based harvesting to cable harvesting, where logs are suspended above the ground by a tower and cables. Plantation harvesting is undertaken according to a strict set of environmental controls to ensure the protection of soil, water, cultural heritage, visual amenity, rare and threatened species and surrounding biodiversity. Logs are transported on customised trucks to our customers across Victoria and southern NSW. The majority of logs (63%) are transported on B-Double trucks, able to take three bays of wood, however where road conditions are tight, the remainder are carried on conventional, two-bay, log trucks. Because trucks must travel on the private foresty roads as well as the open highways they are equipped with central tyre inflation, which allows them to deflate the tyres and minimise damage to road surfaces whilst increasing traction, driver comfort and safety. In addition they have onboard scales to ensure their load complies with the regulations and the majority have tracking devices installed to monitor movements. The logistics of transporting our products to our customers is an enormous task. In addition HVP work with the community to ensure the impact of truck traffic is minimised on local communities. Examples of this are considering school bus routes and times, communication methods such as UHF radios and signage.